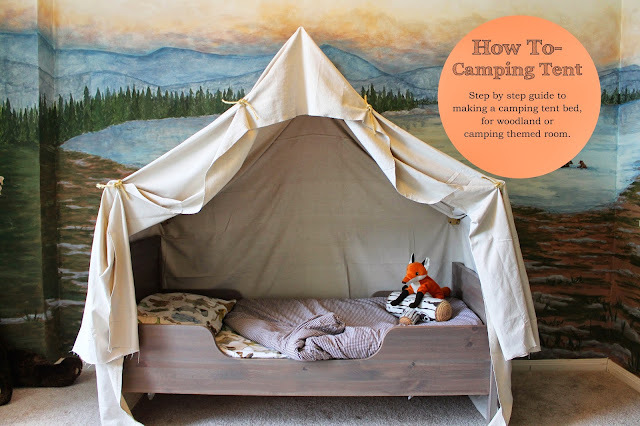 I recently posted some pictures of my son's camping, and as promised I wanted to give you a tutorial on how to make the tent bed. You can find the full room tour here. -A miter box/miter saw/ or a Lowe's guy, you can sweet talk into making a cut on his machine. To start this project you need to have your bed in place. Once this tent is up, it's up, you don't want to move it. 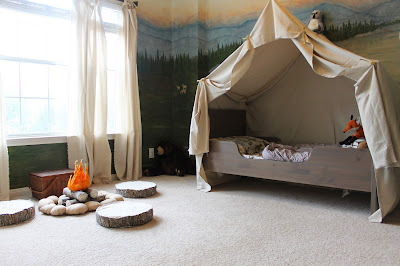 I used a toddler bed placed longways against the wall, but you could use a twin bed coming straight out. 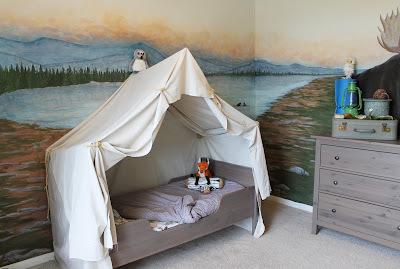 When my son out grows this bed, I plan to use a twin coming straight out with a night stand next to it, since there will be a little bit of room inside. Once you have the bed positioned, decide how much headroom they need, the closer they are, the more they will mess with it. I had my son stand on his bed, and marked it on the wall. If your child is bigger/older, you may want to make the tent less deep so when they stand up they wont be hitting their heads. Since this was a toddler bed, and I was trying to mask this, I put the side pole just about 4" from the top, of the highest rail. The foot board was lower, and father away from the bracket. 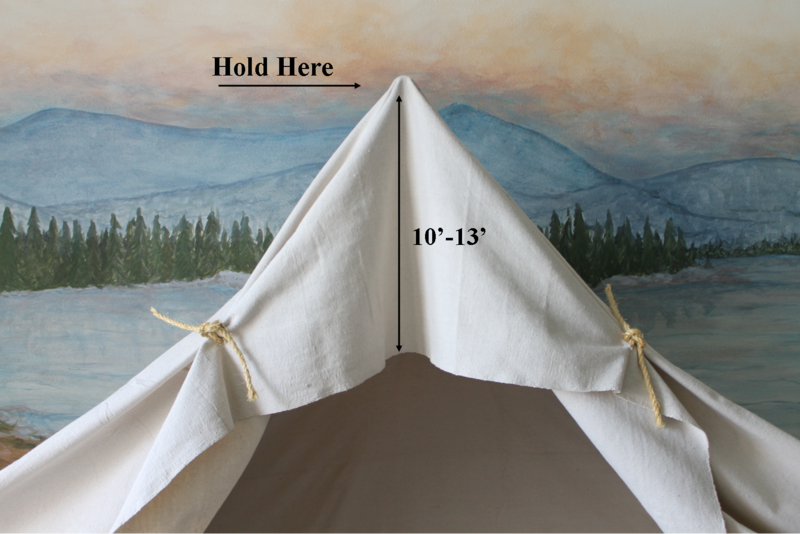 If it helps, put some blue tape on the wall where your measurements are to get a feel of the scale of the tent completed. Maybe have your child get in and out of bed. 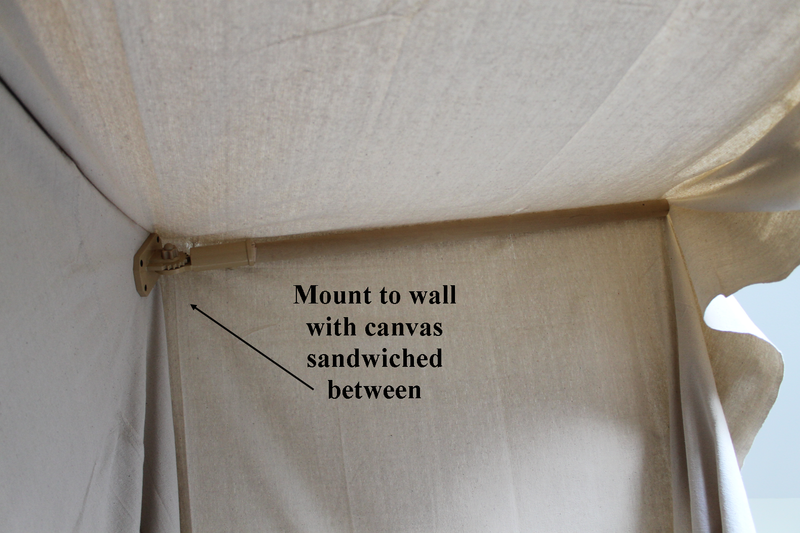 When completed, the tent structure will sit higher than where it is mounted to the wall, because of the angle of the dowel...if that doesn't make sense, keep reading it will. I would go ahead and mark the holes from the base of the bracket, onto the wall, and insert the drywall anchors. Next you will want to hold get your poles ready. 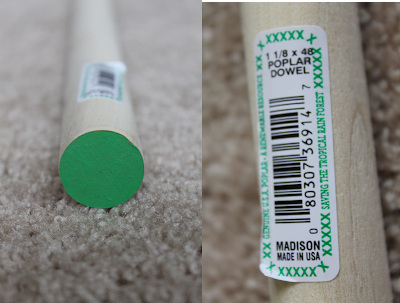 These are the dowels I used. They are poplar, but whatever wood you can find in the right size will work. 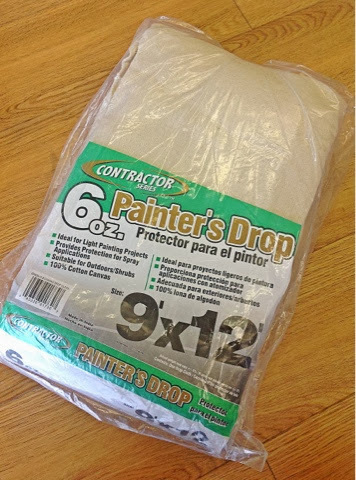 Again, these are from Lowe's and this one is color coded with a green label. This will fit a bit loosely in the holder. The next size up is 1 1/4", and while it does fit in the holder, it only goes in about 1/4", and it wont be secure enough. It is best to cut the length of your dowels here, before you start drilling holes and mounting. Decide how far out from the wall you want the tent to go. On this one, I came out 1" further than the bed itself. Remember when your measuring to take into account the bracket depth, and the angle of the dowel after mounting, as well. I just held it up and eyeballed it, marked it an put the same measurement on the other two. I cut the ends, on a slight angle, not straight across. 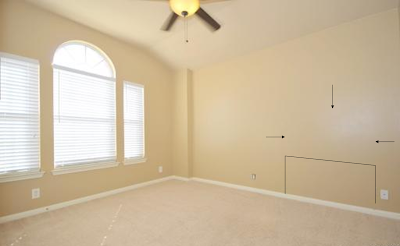 The canvas will sit more flush in the front this way, but isn't completely necessary. A-Metal flag pole bracket, comes in other colors, but this was the closest to the canvas color. You will have to do this three times. You'll be a pro at the end. B- Unscrew the side mounting screw, this one adjusts the angle at which the pole will be mounted. C- Move the dowel holder piece, to an angled position. I have mine in the 5th notch. This is important because, it will have a little bit of weight with the canvas, and with kids tugging at it bit, an you will have less resistance this way. It also props the tent up better, makes it more open inside. D-Unscrew the rod holding screw. It blocks the dowel from going all the way in. Keep it you still need this. E-Place the dowel inside the mount, notice it fits loosely, there is a gap. Push it all the way to the bottom of the holder. F-Hold in place, and with a pencil, mark the hole where the screw fits in. G- This is where you will need the drill bit, 3/16" seemed to be a good size, you don't want it as big, or bigger than the tightening screw pictured, or it will wiggle. You don't need to drill all the way through, just about as deep into the dowel, as the screw is long, not even half way into the dowel. Drill right into the mark you just made. 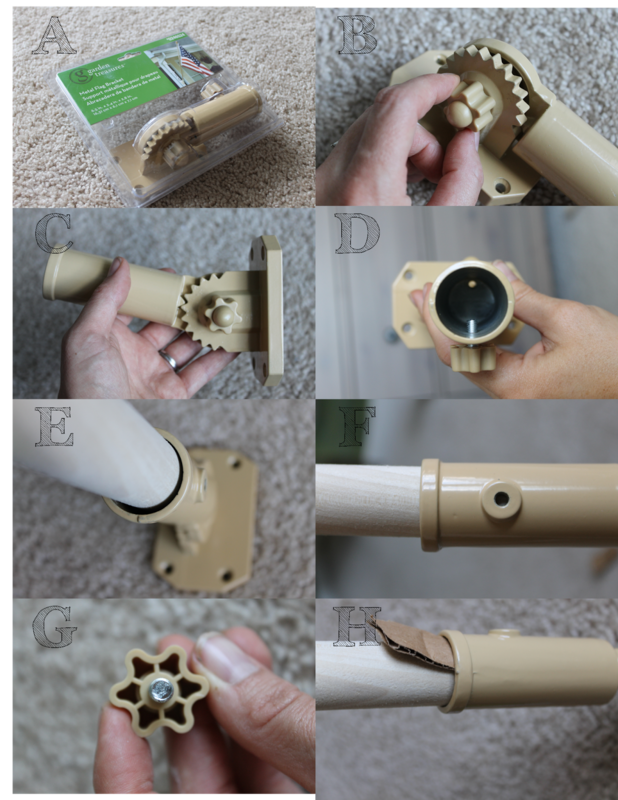 H-Place the dowel back in the pole holder, making sure when your doing this, the screw hole is lined up with you hole you drilled. Now you can use some card board or poster board pieces, to make the fit tight. This is just to keep it from wiggling around. I use a couple pieces of wood veneer I had laying around, I put it in a couple spots, until it fit tightly. Then screw the tightening screw into the hole. Now you will attach the whole thing to the wall. I don't have great pictures for this so bear with me. Here his what the angle will look like when it is attached to the wall. It doesn't go straight out. You are going to lay the canvas out flat, and find the middle. You will want at least 10"-13" hanging down in front of the tent (see below). Mark with a pencil from one side of the canvas that far in. This is where you dowel will start, where it says hold here. You may need two people here, since the canvas is big, it's a bit awkward. 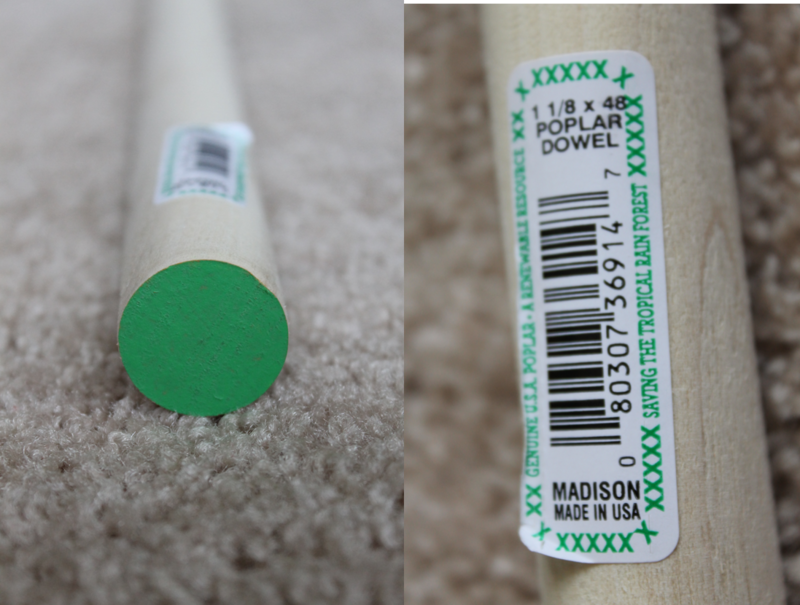 Hold the end of dowel in your mark position 10"-13", I put a dab of hot glue on the end, so it would stay in place. In the picture above, this will be the tallest point where it says, hold here. Pull the canvas over the dowel and bracket so it is now behind the bracket. Best to get under it, to attach it, having someone help hold and line up the pole above. Should look like the picture below, from underneath where you are attaching it. Attach the bracket to the wall with the four screws, going into the dry wall anchors, sandwiching the canvas between the wall and bracket. Pull canvas taught before screwing in. 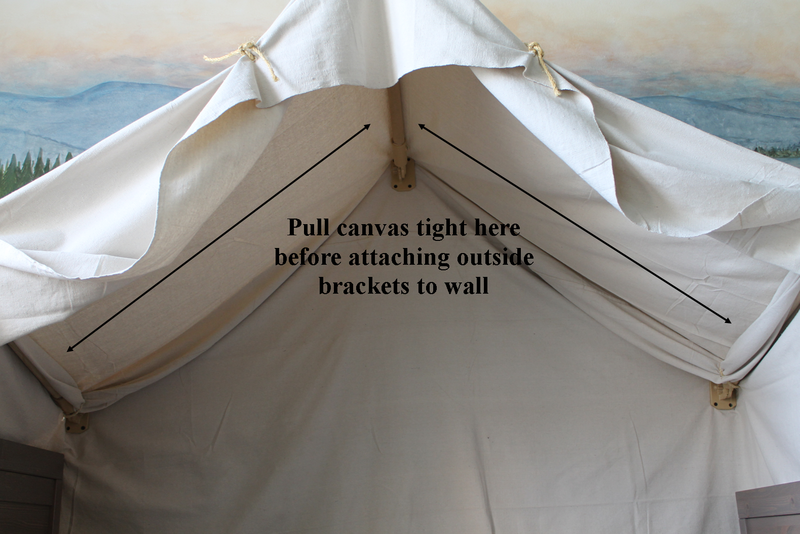 Repeat the process for the left and right side, holding rod and bracket over pre-anchored positions on the wall, and draping the canvas over the dowel. Pull canvas taught so it doesn't drape between the top and side dowels. Again, I dabbed a bit of hot glue on the top of the dowel to keep the canvas in place. The excess will hang into the tent. There will be extra canvas when you pull this tight. I used it to cover up the dowel on the insde of the tent. otherwise it will just hang there. Now you will screw the canvas into the outside part of the dowel ends. Before you do this wrap and tuck any extra canvas, until you get the look you want, and then screw it into place. You can cut and hot glue pieces together, if you don't want the extra showing. This is meant to be a outdoor tent look, so cleaner is probably not better here. To gather the fabric, and really give it the tent look....I cut two holes in the fabric, on the top seam, and a piece that draped down. This will eventually cover up the end of the screws. Play with this before you cut the holes, you want the drape to look natural, and not all gathered up in front. It took several rearrangements to get it where i wanted it. Remember what you did, as you will be doing it again on the other side. 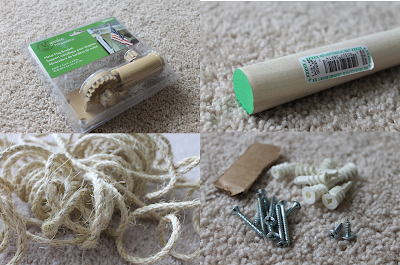 I thread a piece of the rope through each hole, pulled and tied it twice. For the top front of the tent, I used the same idea for attaching the pieces together. I wanted it straight across in the front, so I got it where I wanted it, and pinch the top and front canvas together, made holes, and put the rope through. This is how the sides of the tent look. Without sewing and really mapping it all out you will have excess fabric. If you want a cleaner look you could take the extra time to do that. I think it should look like a tent some kids and a camp counselor put together outside, so very imperfect. Or at least claim that's what you wanted it to look like. Here is what you will end up with. To see the rest of the room, and how it all came together, click here. 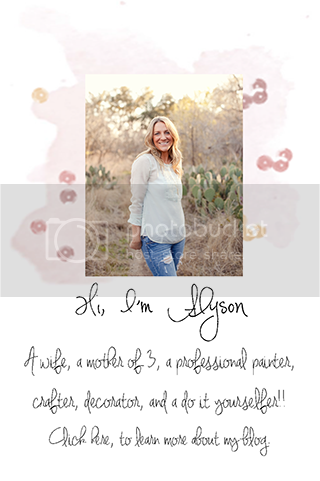 Follow along with the blog, or sign up to receive it by email, in the top right corner, so you wont miss a thing! you must be the coolest mom. This would take me forever! My son would love, love this... so I may attempt. What size? is your sons bed in the picture? Aww thanks! He has a toddler bed form ikea right now, but you could stick a twin coming out from the wall as well. If you make it wide enough, you could add a tree stump night stand to either side. My husband and I were thinking about buying the materials in advance and attempting to put this together for our 2-year old daughter on Christmas Eve (having her sleep in our bed that night). Is this feasible? How long did it take you to do it? Thanks! What a great use!! Not more than an hour and a half or so. And I didn't it by myself. If you got the dowels cut and put together, it wouldn't take long at all. Do you happen to remember the name of the bed from ikea? This room is so perfect! They actually don't sell the same end anymore..but sell a similar version that is extendable now. Hi! I am an interior designer based out of Chicago. I am working on a model home in Texas and would love to use this canopy. Is there anyway you could make this for me and I could purchase it?